With Halloween comes mischief and messes: toilet papering, pumpkin smashing, and worst of all, egging. A favorite item among Halloween vandals, eggs can cause much more than a stinky mess. The enzymes, protein and sulfur in the egg all react with paint on vehicles and siding, and if allowed to dry, can actually remove the paint or at least cause staining. A home or business owner’s best defense is to remove the egg as quickly as possible, while it is still wet. Once the egg dries, it not only becomes physically tougher, it converts into a simple protein glue that adheres to the surface, which, unfortunately, is often paint. In an article for Popular Mechanics, the author turned to the food service industry — particularly those that work with eggs — to get their tips on removing eggs from surfaces. The following points are taken primarily from that article, and can be applied by professional pressure washing contractors. 1. Carefully remove any remnants of shell so as to avoid scratching the surface. 2 Use lukewarm water, NOT hot. Because eggs are protein based, hot water will cook the egg and make it attach even tighter to the surface. 3 Wet the area beneath the egg first to protect the siding from further damage during removal. Next, using a low-pressure spray, work from above the egg — using a ladder if necessary — and loosen the egg by spraying down from the top. This should loosen the egg safely. Don’t attack the egg straight-on. 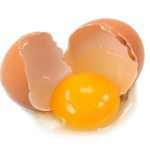 4 To remove the egg’s fats and proteins, use an alkaline cleaner. (Butyl-based products seem to be the recommended choice on the pressure washing industry forums.) A number of home remedies call for the use of an acidic cleaner — such as vinegar and water — but this actually can make the problem worse. Dishwashing liquids are also mentioned as home remedies, but these are generally not strong enough. Home products like Simple Green or Formula 409 will probably work if a professional product is not used. The process is essentially the same as above, only you will need to attack with your cleaner first, and will likely have to repeat the process. 1. Remove remnants of shell. 2. Wet the area below where the egg is dried on the surface. 3. Gently scrub an alkaline cleaner over the area with the dried egg using a brush. 4. Rinse with low pressure, lukewarm water (again, not hot), directing the spray down from the top. 5. Repeat until the egg is removed. Vehicles are a different story because the chance of damaging or scratching the paint is significantly higher than on a home. Vehicle paint is not designed to withstand the strong alkalines that vinyl siding can. 1. Water is going to be the primary helper in removing egg from a vehicle. Pre-wet, then wet, then wet again. Keep the surface wet. 2. Use a professional quality carwash cleaner and a gentle terry cloth towel designed for vehicles. With vehicles in particular, however, there is no guarantee you’re going to be able to remove the egg without leaving a stain. Click here to read the original Popular Mechanics article, “So You’ve Just Been Egged” by Roy Berendsohn, originally published October 26, 2010.